I managed to sneak in a little crafting time this weekend. 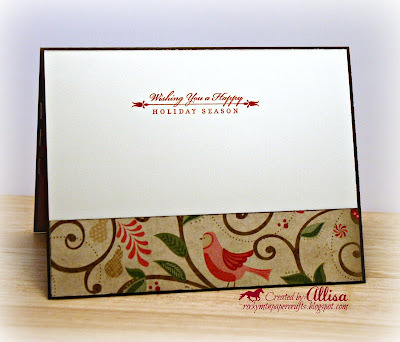 I grabbed the Pear & Partridge Card Making Kit and the sketch from Merry Monday to complete another Christmas card for my stash! This will be the first year that I will not be scrambling to make Christmas cards! If you have yet to get started...now is the time! OK - because you sell the product I can say this - I don't think a card could be bad with this kit! Lovely, lovely colors and paper. You have shown them off well! These little ornaments are so pretty and I love how you knotted the ribbon! Very creative, Alissa! 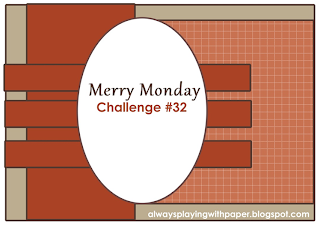 Thanks for sharing it with us at Merry Monday! Great sketch and beautiful results. The card is gorgeous and the ribbon treatment is so cool. Thanks for sharing your art in the Creative Inspirations Paints blog challenge. Your card is gorgeous! Love your take on the sketch!! 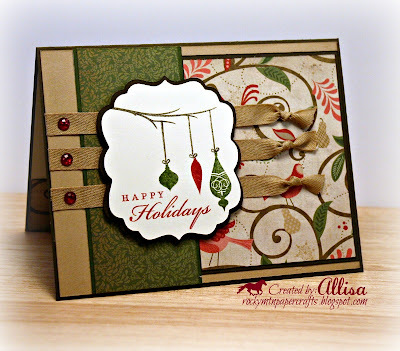 TFS and playing along with this weeks Inspired By Challenge over at Creative Inspirations Paint! We hope to see you join in our next challenge beginning on Sunday! This is a beautiful Christmas card. Thank you for joining the Creative Inspirations Paint challenge this week.